It is all about veterans on this episode! We hear from Jarret Alan Schlaff who is the founder and the main visionary over at Pingree. He shares how the whole idea began and, even, how the name came to be near the end. You won’t want to miss it! Stay tuned until the end when we share another great Detroit artist with you. Welcome everyone, this is Romy, and I am excited to tell you about Pingree Manufacturing today! It is all about veterans on this episode! So, we will hear from Jarret Alan Sheff who is the founder and, I would surmise, the main visionary over at Pingree. He shares how the whole idea began and, even, how the name came to be near the end. You won’t want to miss it! Stay tuned until the end when we share another great Detroit artist with you. What is happening in our Fun Fuel for today? Luke, what do you have for us? Hi! This is Luke Trombley, and I am bringing you the fun fuel for this episode. 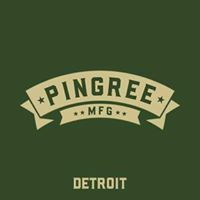 The company name, Pingree Manufacturing, actually came from the Detroit mayor that served four terms, Hazen S Pingree. Thanks Luke! Okay, let’s drop in on the conversation with Jarret and see what is walking in and out of Pingree in Detroit. Romy:	Okay. Well, cool. We're here at Pingree. 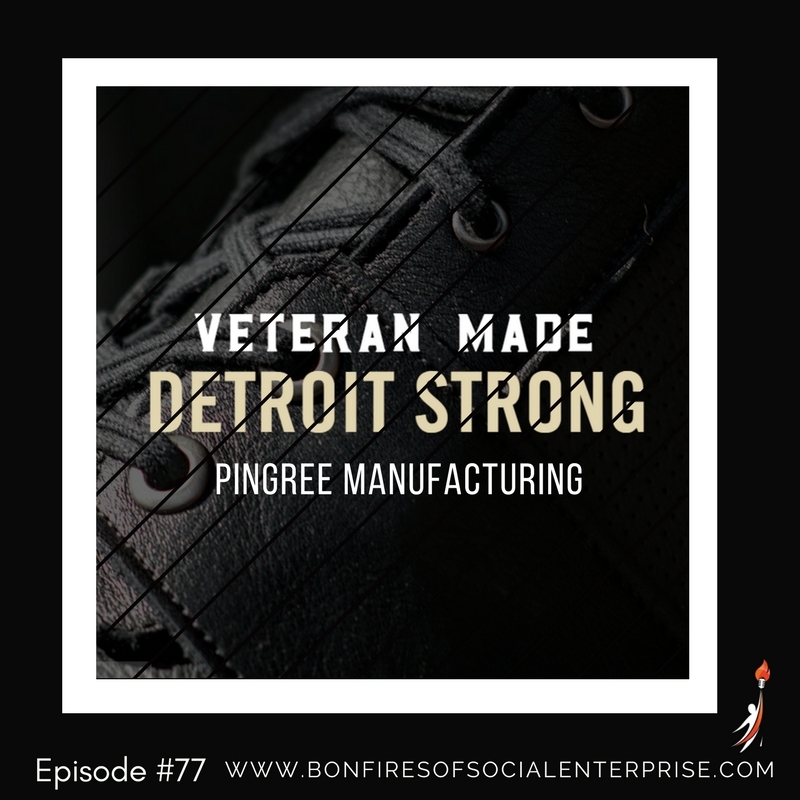 It's Pingree Manufacturing of Detroit? Jarret:	Yeah. Pingree Manufacturing. Some know us as Pingree Detroit. Some know us just as Pingree. Romy:	Okay. Well, tell us about Pingree. Jarret:	Yeah. We're a social impact startup committed to creating living-wage work for veterans that are overcoming homelessness or unemployment by building some exciting accessories, gear, and footwear using reclaimed leather and other materials from the auto industry. Romy:	Yeah. Wow, okay. I want to really dive into all those, but where originally did the idea come from to even get into this? Jarret:	Yeah. We started probably a little differently than most companies do. We started more from the impact side where there was a veteran that was living and squatting in my neighborhood. Talking to the man, he was a Marine not too much older than me and was just looking for an opportunity. He had overcome his own addictions. He was just looking for gainful employment. That same week I met another, happened to be a Marine ... A big part of my upbringing was a Marine Corps drill sergeant ... Meeting another Marine who was walking on the street going business to business looking for work. Got to know this guy, he had a master's in engineering and a JD and was sleeping in his car. That, to me, just ... It shook me. It was like this back-to-back moment where I literally remember saying, "Someone's gotta do something about this. It's unacceptable." When I said it out loud, "Someone's gotta do something about this," really, I kind of, my core was like, "I can do something about this." At that time, I stepped away from my past job and started on this three-month exploratory, I guess, journey talking to veteran's organizations, nonprofits, businesses, veterans in my family, in my circle of support, my friends, saying, "Hey, what's the current gaps in the space? Why are there men and women like Mike and these different folks who aren't getting the support they need? What are the gaps? What are the needs?" Across the board, this huge gap was between the provision of basic needs where people's survival is covered to the point of gainful employment. There are often the access to the training, the pathway, and the actual living-wage jobs that are accessible and are working and focused on connecting with these men and women. We started the question, if we're going to create work, and we're going to create, specifically I guess, focused on creating this work for the men and women that have served in our military who are looking for an opportunity, what could we do that is really representative of this resurgence in Detroit where these folks love working with their hands? They are looking to contribute. What can we create that really embodies all this? In talking to an elder in my neighborhood, he said out loud when I was sharing with him how frustrated I was and excited about the opportunity to create some work, he's like, "You know, you just ... You've gotta be the boots on the ground." Jarret:	That was our name, as there was a group veterans and civilians who came together and were exploring this together. That was our rally cry. The name of our business, for a while, as we were just getting organized was The Boots on the Ground, Project Boots on the Ground, and Boots. We were like, "Wow. They haven't built boots in Detroit since the '50s. What if we did? What if we brought and re-shored American manufacturing, created work for some of the folks who know boots better than most?" So Boots on the Ground was born, which has since evolved into Pingree Manufacturing. As it sometimes is said, "If you see a better way, find a way to make that happen," and so we were on that pathway. Romy:	How long ago was that, that moment from the conversation on the sidewalk until now? Jarret:	Yeah. We formalized in January of 2015, and we've been on a pathway ... I've been doing this part-time without taking a payment, but we've housed two veterans in that period of time. We've gotten three other veterans part-time work. We've done close to 150 hours of outreach time. We're just literally sitting down with veterans in shelters and veteran's organizations and saying, "What do you need? What do you want to see? What would an ideal work environment look like? How would you be able to thrive in a work experience?" Really trying to go to where they're at and design the solution, not around what we think sounds good, but actually what the needs are and what's missing. Romy:	Of the veteran. That's really interesting. You're the first social entrepreneur I've heard really designing the business solutions around your potential employee. That's so fascinating. Jarret:	The thought is, I was involved in some other, I guess you would call, organizing and capacity building within organizations. Often what we found was missing was this community-focused perspective of identifying the needs and actually wanting to listen to what people want and need before first saying ... I have my vision. I still have my vision, but that vision has become so much more developed, and powerful, and creative. Actually, there's a very clear focus on what the needs are, and we're, I feel like, much more equipped to both support the unique population of folks who want to work alongside, and also create this experience that we think can just really transform the lives of so many folks we work with. Romy:	You said you housed them. What does that mean for folks that might not know that term? Jarret:	Sure, yeah. Men and women who have been homeless, we have just supported them on their pathway to getting housing. Some of it's subsidized housing. Some of it's getting an apartment again. Getting connected with the support they need. Our first actual workers ... We have both a volunteer ten-person vision council, currently, that serves as our advisory board as we're developing our full-time board. That's all veterans, as well as a spouse of a veteran, and then another advisor that's not a veteran. Then we've got our actual paid team, which is currently two part-time veteran crafters. Then we have everyone else. One of our co-owners, he's working in the beautiful sweat equity realm right now where he's doing all of our marketing, communications, branding. He's a US Army veteran. Then we've got full-time, well soon to be full-time, master boot maker and a production manager. Those two women are not veterans. Yeah. Roughly, we have a majority veteran workforce. The goal is, in the next five years, to have the company be lead and majority-owned by veterans. Romy:	Wow, that's exciting. There's so many questions I could go to, but I want to make sure I capture some of the other places for our listeners. Let's go then now to the revenue model for the business and then the boots. Romy:	The revenue model for the business, how does that work then? Jarret:	Yeah. We are looking at a multi-tiered approach of how we can share this opportunity to participate with our brands to our customers. It's both a direct e-commerce model where we have a pretty large following and pretty large support network online ... That's your traditional e-commerce store, the large social media telling campaigns. Just this last winter, we were on Channel Two, Channel Four, Channel Seven. We had a 10-second commercial that aired in all the Imagine theaters in all of Metro Detroit for all of December and January. It was on a loop. They estimate we were in front of 200,000 people, our target audience. We've got out there. We've made this first touch, the second kind of first conversation, almost, introducing what we're going to do. Now we have an opportunity to actually officially unveil our first products come July 1st. There will be e-commerce. That will be coupled with a wholesale distribution model with some of the local really powerhouse vendors in Detroit. We're crossing our fingers and hoping to get in some of these local stores that really have a beautiful relationship with local community. I won't name one on the podcast. I don't want to jinx us, but there's some folks like Pure Detroit who we would love to work with. Yeah. We're really looking at both, that large online presence coupled with our ... I guess almost these wholesale distributors coupled with what we're terming as usage partners. We would love for our tote bag to be in every yoga shop in metro Detroit. To walk into a yoga studio not expecting to see a bag that could be co-branded with that yoga studio, built with all reclaimed leather from the auto industry, handmade by veterans, and then at a price that is accessible, to us is exciting. We're actually making a yoga strap holder that can be an add-on to any bag, or it could be a wine bottle opener if you want, right? It will have multiple versatility options, right? Having those, and then we're also exploring partnerships literally where ... I won't name ones that aren't currently fully established, but there's a lot of those kind of potential synergies where we could provide an opportunity for the customers of these different businesses, getting these in the hands of folks, from our backpacks that we're first unveiling, as well as our boots that we'll unveil likely in the early summer. Romy:	Shout out to them. Jarret:	Right. They made it possible for us to be here. Yeah. We'll have this nook where folks can come. It might be on a Saturday or a Sunday. We're still going to work out our schedule, but we'd love to invite folks to our space to try on our boots in-house, try on our bags, see how these things are made, see where they come from. Definitely. Romy:	Let's go to the boots. Romy:	Let's go to the boot products. Romy:	Who do you envision as the buyer of these boots? Jarret:	Yeah. We designed from the perspective of, as we way, we're designing for comfort, classic durability, urban sensibility, and this distinct Detroit flair that really embodies the type of comfort that you'd expect from a work boot, but the versatility and fashion that you might expect in a luxury boot. We want to create this beautiful blend that we're calling an urban utility boot. Our ideal target that would want to be able to wear these boots would be our young professionals in cities. In Detroit, we have a very large and growing emerging audience of millennials, mostly, who are both looking to wear their values and also looking to look good and feel good while they're doing it, both in a comfort perspective and the impact. Not only does our story speak for itself, but the products are going to be world-class. We're not going to give you something that's going to fall apart. It's going to be as good or better than our competition because it's employing this hand craftsmanship that's been tested. Our boot maker was the former co-founder of another booth company in Flint. At Sutorial, they make gorgeous high-end boots. We're blending this hand craftsmanship with the tested durability of folks like Wolverine who we're also collaborating and getting mentored by. We bring this beautiful blend that allows someone to wear their boots to the office, on their bike, wear if they want to ride the motorcycle, go out with friends. It can really open up and be versatile enough for the occasion. As we often say as kind of a fun little aside, we go, "Wherever your adventure takes you," right, "we've got you covered." Romy:	For men and women? Romy:	Okay. Wow, that's great. Romy:	... because that's an amazing ... Not that you don't already have bunch of impact going on. Let's add on some upcycling, too. Jarret:	Sure. This is kind of an interesting story. Part of our grounding as a company is we think it's pretty common sense to create products and processes in our production that maximize well-being of our workers and our community. To us, our community includes what happens when this byproduct of a production process goes to the landfill? How are we affecting the water with the materials we use? Is there toxicity? What's the carbon impact? We think it's good to think about these things since we're all in this together. When we're producing our bags and our boots, we wanted to be mindful of that impact really. We're looking and saying, "How can we both create a sustainable boot that's not just saying, 'We're sustainable,' but really it's not ... Not greenwashing, but actually creating a radically new level of connection to exactly the impact of what the products are creating?" We started and said, "What could be a potential waste stream that we could turn into an input?" About four jobs ago, I was the materials byproducts synergy coordinator for the state of Michigan. I worked for the state essentially coordinating the sharing of waste streams among Tier 1, Tier 2 suppliers, Dow Chemical, all these massive companies all throughout Michigan. My job was to make these connections. As an example, the waste from a car was turned into a bat house. This raw elemental component was used by ... That was an excess from one chemical company was used as an input for a cement manufacturer who otherwise was having to purchase the raw material. Turning "waste" into a resource, we're the only species that creates waste. Everything else, everything works and creates an input for something else. From a physics perspective, energy is never created or destroyed, so why are you producing stuff that ends? Why can't we create a full-cycle analysis on our product? When we came to our materials, both looking from how we can be different to how we can also set the bar a little higher on really being present to the possibility of creating the products that we know we need to create that we just haven't done yet. Starting from a place of what materials can we use that currently are being thrown away? Wow, it took about seven different conversations. I won't go in depth but, essentially, we landed on the opportunity to use what otherwise was a waste with leather where there was some scrap, and there was also elements that weren't being used, where we could take it, reclaim it, and instead of it getting shipped to China or thrown away, we turned it into an input for our boots. Romy:	Oh, I suppose, because it's usually for car use, right? Romy:	So it's got to be tough, right? Jarret:	The leather we get is from a facility that does R&D for about 75% of the companies that are in the Detroit Auto Show every year. It's the best of the best. Liability-wise, we can't name names of the cars, but let's just say the best of the best, and we're able to turn that into boots and different products. Romy:	Where was that scrap going before, to the best of your guess? Jarret:	Yeah. It was literally being shipped to China. It was shipped to China, and some of it was landfilled. Romy:	Wow. Do you think there's enough? I'm assuming there's enough supply of that to keep you busy for a while? Jarret:	Let's hope that the auto industry keeps growing and succeeding as it has been. As the growth continues ... You've got to do basic testing on raw materials. Sometimes there's a color differentiation that will have a hide not meet the mark. Sometimes it's when they're doing their cutting; they just can't avoid having excess. We found a sweet spot where we could turn what would otherwise be a negative and turn it into a positive, and acquiring it at a price we can afford to acquire it at, and then turn that into these high-end ... I've been beating the heck out of a pair of boots that I made with that leather, and we'll continue doing the testing for the coming years. As we grow, we'll expand to different materials as well. We would love to get into hemp. In the United States ... If you know anything about hemp, in the early days, if you were a landowner in the Founding Father days, literally it was a law that you had to grow a certain amount of hemp on your fields because of how important it was to industry at that time. The importance has never changed. We just made it illegal because it was the cousin of what people know as cannabis with marijuana. To us, it's the most resilient fiber you can buy. It doesn't get the ... Because of the antifungal properties ... I won't go on a whole spiel about hemp, but the capabilities from a materials perspective, the breathability, the durability, even using it eventually for materials for housing, to cement, to it's the highest protein seed that you can buy in the market ... For some reason, it's illegal to grow in the United States right now. To me, that's a hindrance on the market for us to be able to grow and create work and grow our very materials. We're hopeful that we will have enlightened decisions by our policymakers that will enable us not to have to import from Canada. To us, that's ridiculous. We can import it, pay a tax and import it, but why not create jobs right here? We see an opportunity to do that. The material, similar to a cotton, how a cotton's blended with synthetics, it's unrivaled in its performance. We hope to start to bring those accents in. Another exciting component is we don't know of anyone in the world doing this with footwear. We're right now researching and exploring. We actually have a collaborative partnership with a US, actually, a Michigan-based rubber manufacturing plant where we're going to be building soles out of dandelion latex. They did this back in World War II days when there was a lack of access to the rubber trees in Asia, and in Latin America, and South America. Essentially, they are from Kazakhstan. These dandelion plants have about 15% latex when they're ground up, so you can literally extract latex. There's amazing groups out of Ohio state doing tons of research. They're about almost 10 years into their research in Ohio state as well as in Missouri. We would love to be the first application of dandelion rubber in one of our soles that we produce, as well as traditional soles that if folks don't want to wear flower soles. We think, "Why not grow our soles locally?" Romy:	No pun on that. Jarret:	We'll sell our soles to people, too. Romy:	Sell your sole locally. I love that. That's so good. Jarret:	I'll try to keep the puns to a minimum. I've got a lot of foot puns [inaudible 00:21:08]. I keep them under wraps, usually. One step at a time. Jarret:	That's another example, right? One might see that as a burden, or a waste, or just a nuisance. There are so many inherent opportunities that we might just overlook. How can we turn a perspective and, yeah, turn it into an opportunity and work? Romy:	Well, you're really after systemic change. Romy:	Let me kind of come to a close because I could probably stay here for about five hours and ask you questions. We'll have to come back. What's the best way for them to find you on the web, maybe a website or social media if you have it? Jarret:	Perfect. Yeah. They can find us on Instagram, Facebook, and Twitter at the hashtag or @pingreedetroit. That's P-I-N-G-R-E-E Detroit. Also, our website, currently it's detroitboots.com. It'll soon also be pingreedetroit.com, but they can find us either way. A real quick aside, we named our company Pingree after a guy named Hazen S. Pingree who, in 1890, he was a Civil War veteran who broke out of a prison camp. He broke out of a Confederate prison camp and with some of his fellow Union soldiers, they convinced him to come to Detroit, fell in love with Detroit, became a boot maker, became the second-largest boot maker in the country, then ran and became the mayor of Detroit, was rated the fourth most progressive mayor in all of US history, and then became the governor of Michigan, 24th governor of Michigan, represents this level of service, and just championing what's best for the people. We really are inspired to create a legacy that creates opportunities for veterans and creates products that, to us, set the bar and will allow us to have this longevity of setting the curve, creating the jobs that will sustain for the long term, and just keep moving forward. Romy:	Wow. Well, thank you. Feeling some sort of documentary movies that will end up on these guys. I can just see that coming. All right. Well, that was awesome. Jarret:	Thank you for your time. A big thanks to Jarret! We are very excited to stay connected to your journey! I just know that discipline of his is going to push through incredible barriers! You know, we forget about discipline. Yup, good ole’ fashion discipline. It is so critical in any type of social enterprise, probably more than other types of business considering all of the boundaries we have to keep! Great job Jarret! Well, it’s that time again, to close out with another great Detroit artist.